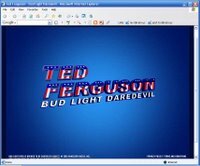 ok Bill as a Bud Light drinker I found the Ted Ferguson campaign dumb but I suppose if it supposed to target 21-45 male demographic that would explain why my boyfriend(age 54) and myself (50yr old female )thought it was stupid and were ready to give up Bud Light(although that didn't happen. )We both prefer the clydsdales Man I feel old!! !